I love the taste of Bramley apples in a recipe. It always reminds me of my grandparents. They had a couple of trees in the garden, and two or three times a week the apples would find their way on to the table, whether in an apple sauce for the roast pork on a Sunday, or a pie or crumble for a dessert or aft er-school treat. It’s actually Bramley Apple Week next week. I think it’s good to raise the profile of foods that people may have forgotten how to cook, particularly ones like this that suit so many sweet and savoury dishes. If you haven’t used them for a while, I’d say that Bramleys are ripe for rediscovery. Jerusalem artichokes have no particular connection to Jerusalem, and nor are they artichokes. They do, however, have a lovely, slightly sweet and earthy flavour that pairs superbly with Bramleys. Melt the butter in a saucepan and gently cook the leek for about 3-4 minutes until soft. Add the quartered artichokes and the vegetable stock and lightly season. Bring to the boil and simmer gently for about 15 minutes, then add the apple and continue simmering for another 10 minutes until the artichoke is cooked. Blend in a liquidiser until smooth – you can adjust the consistency, if necessary, by adding a little more stock – then strain through a fine-meshed sieve into a clean saucepan. Heat the oil in a frying pan and gently fry the cubed artichokes for 4-5 minutes, seasoning them as they are cooking, until they are nicely crsip and golden, then drain on some kitchen paper. To serve, reheat the soup, adding the cream, and season to taste. 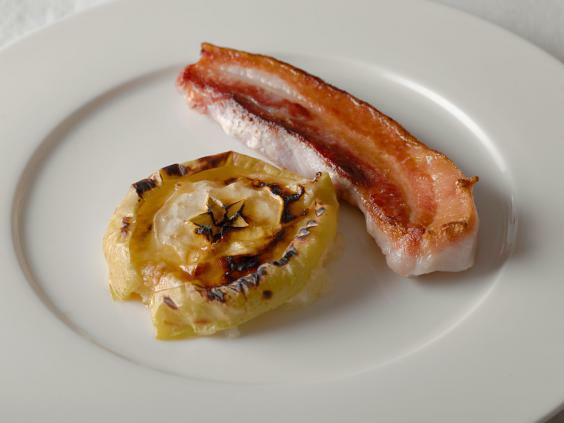 Transfer to warmed soup bowls and spoon the crisp artichokes over. I love cooking dishes like this based around just a couple of simple, tasty ingredients. It’s all about matching and marrying big, classic flavours. You can use chicken or duck livers, but ensure that they are fresh and not previously frozen, as they can go a bit mushy when defrosted. If you’re feeling adventurous, you could try using pig, lamb or even deer liver. Put the apples in a heavy-based pan with the sugar and half of the butter. Cook on a gentle heat with a lid on for 4-5 minutes, stirring as it’s cooking until the apples are soft. Remove from the heat and blend until smooth in a liquidiser, then return to the pan and keep warm. Season the livers, melt the remaining butter in a frying pan until it’s foaming, then fry the livers for a couple minutes on each side, keeping them nice and pink. 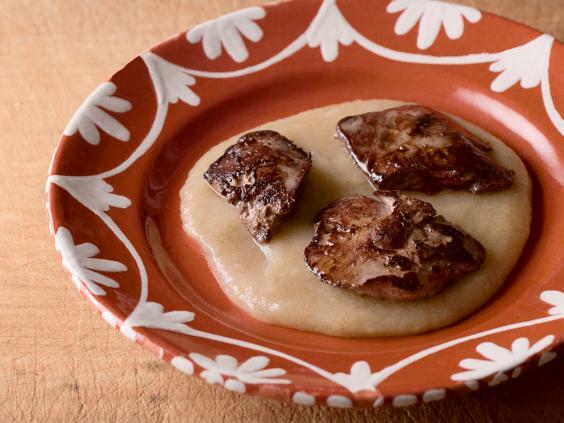 To serve, spoon the apple purée on to warmed serving plates and arrange the livers on top. Frying slices of apple is quite an old-fashioned practice. It really brings out the sweetness and together with the butter makes for a lovely partner to bacon. Heat a preferably non-stick frying pan with a little butter. Sugar the apples and fry on a medium heat for a couple minutes on each side until golden, basting with more butter during cooking. Meanwhile, heat a ribbed griddle or heavy frying pan and cook the chops for 3-4 minutes on each side, then arrange on warmed serving plates with the apple. This is a great cake to serve as a teatime treat or as an unusual accompaniment to a winter soup. Prepare a loose-bottomed, roughly 23cm x 11cm x 9cm deep loaf tin by greasing it lightly if it’s non-stick, or lining the base with buttered greaseproof paper if not. Preheat the oven to 160C/gas mark 3. Transfer to the loaf tin, scatter the extra cheese on top and bake for 1¼ hours, or until a skewer inserted into the centre comes out clean. Cool in the tin, then carefully turn out. Serve while warm or later at room temperature.